Luova is a Finnish word that means to create. But life is busy—how do we find time for creative expression? Spend a week in a villa with E. Colin Williams, Nikki Tate and the rest of the Luova support team and let your creative side come out and play. Take inspiration from the peaceful, small-town surroundings, be supported by our creatives, start the morning with a relaxing yoga class, take a dip in the pool, enjoy meals prepared with fresh, local ingredients, and enjoy engaging cultural excursions. Whether you want to pick up a paintbrush for the first time in years, experiment with collage and mixed media, or try your hand at some creative writing, this creativity retreat offers a stimulating blend of support, encouragement and enthusiasm as well as time to reflect, explore, and create. Visit the retreat home page at WeTravel (https://www.wetravel.com/users/danielle-tate-stratton-0b61b85e-2c27-4ae7-a42d-7d490ac840f8) for more information. As part of a project leading up to a planned trip to Spain to walk the last 120 kilometers or so of the Camino de Santiago later this year, Dani, Dad and I have been having some conversations about the artistic process. Dani (my daughter) and I are both writers, Dani is a graphic designer, and Dad, of course is a painter. We all enjoy photography. We've decided to write about the trip, but we are also making a series of short videos exploring the creative process. Here's a link to a short video (a test of the equipment and set-up in Dad's studio) that shows him drawing a tree. Over the coming months, we'll made more videos and post them. I never get tired of watching Dad draw - I hope you find it interesting as well. 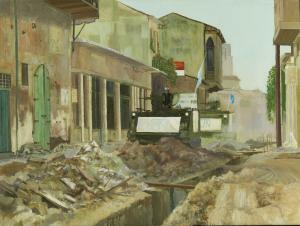 Here's Dad with the paintings - one of old town Nicosia on Cyrpus (this shows Canadian peacekeepers patrolling the Green Line) and the second of a JEEP crossing the Suez Canal on a floating/temporary bridge. Finally! 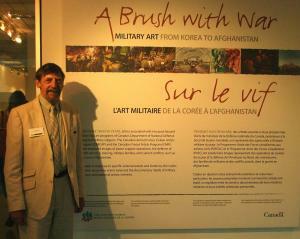 After years (literally) of waiting, the Brush With War exhibition made it to Victoria. Dad and I attended the opening at the Art Gallery of Greater Victoria on Thursday, June 23. 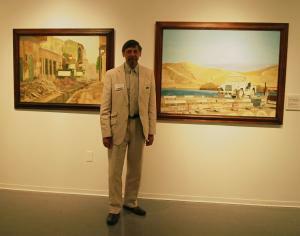 It was very cool to see Dad there with the two paintings of his that were selected for inclusion in the show. Dr. Laura Brandon (from the National War Museum) gave a short talk before we were all allowed in to see the show. And, what a show it is! It includes a wide range of styles and approaches to war art by artists across the country and spanning the decades (and conflicts) with which Canadian troops have been involved since WWII. This is an exhibition well worth seeing if you happen to be in town this summer. Curious about how a painting develops from sketchiest of sketches to finished piece? Have a look at the short (less than a minute) video I put together of Dad's painting "Preservation" as it was being painted. Okay, I confess that I�m a little behind with the blogging. Things have been kind of busy around here� excuses, excuses. To backtrack a little � at the end of August the merchants of Humboldt Street in downtown Victoria, BC got together to host the first [annual?] Humboldt Valley Festival of the Arts. The Winchester Gallery was one of the organizers and Dad, along with various other Winchester artists, set up in the plaza outside the gallery. As luck would have it, the day was the hottest of the entire summer, so everyone � artists, musicians, street theatre players, and visitors alike sweltered in the blazing heat. We are just not used to that kind of thing here in Victoria! Dad held up remarkably well, working away on a small oil painting of the view down Finlayson Arm (we have a HUGE interpretation of this view in the living room � two panels creating a massive 8� X 8� diptych). Despite the heat, lots of people stopped by to chat and many had very good things to say about Dad�s work. In particular, the oil painting, �Alberta Schoolhouse Doorknob� prompted many comments. When you get up close to the painting, you see there�s a bullet hole right in the old doorknob � perhaps put there by some grouchy Albertan who had less than fond memories of days spent in the classroom! The event was lovely and we are looking forward to next year already! "War and art may seem a strange combination, but, around the world and for centuries, moments in military history have been immortalized in art. In Canada, governments and armed forces, since the First World War, have encouraged artists to represent their operations, battles, and aid to civilians through art." Sometimes it's tough living with a talented, but reclusive, artist, which is why I've set up this page for my father, E. Colin Williams. It is nice to see the genuine relief when people realize that Dad is still alive and well and painting up a storm, but quite funny when they blurt out comments like, "I thought for sure he was dead!" Yes, Dad is in his seventies and, yes, he likes the limelight about as much as most of us enjoy dental surgery, but it seems to me that there is no reason why this should mean Dad's amazing paintings shouldn't be getting a bit more exposure than they have in recent years. One of the reasons why I'm starting this blog is to try to track down some of Dad's pictures. 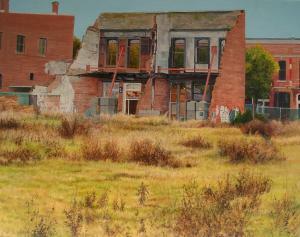 If you happen to own a painting (it might be signed 'Colin Williams' instead of 'E. Colin Williams'), please send me a scan and let me know. The other reason is to let the world know that yes, Dad is still alive and well and also to share a bit about what he is up to, artistically speaking. The image attached to this entry, for example, is a page from a recent sketchbook. 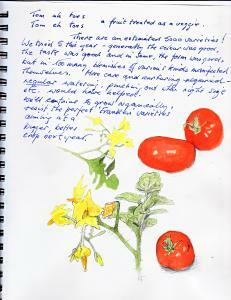 I asked him to come up with a couple of drawings to post on my other blog (www.darkcreekfarm.blogspot.com) and this was a page relating to the subject of tomatoes. Which just goes to show, if you see the world with a painter's eye, you can create something beautiful from pretty well any subject!